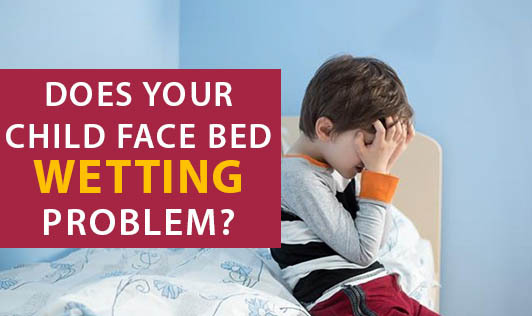 Does Your Child Face Bed Wetting Problem? Bedwetting is a common problem for many children and adolescents. Common treatments can include behavioral modifications, bedwetting alarms and medications. 1.Ask your child to use the bathroom at night before going to bed. 2.Limit the amount of fluid your child drinks 2 to 3 hours before bedtime. 3.Do not give your child caffeinated drinks such as colas and teas as they increase the frequency and amount of urine produced. 4.Do not scold your child for bed-wetting. Convince him that the condition can be overcome gradually. 5.Praise your child for dry nights and reward him/her. 6.Involve your child in daily activities like arranging bed, laundering the sheets. 7.Have an early dinner, and ascertain that your child doesn't have any fluids after that. 8.Set a specific time, say 3 to 4 hours after your child has gone to the bed, and wake him up to make him urinate. 9.Encourage the child to get up to urinate if he feels like urinating in the middle of the night. 10.Use an alarm system that rings before the bed gets wet and teaches the child to respond to bladder sensations at night. Consult your doctor for more tips. Talk to your friends who are facing same problem with their children and how they did over come.